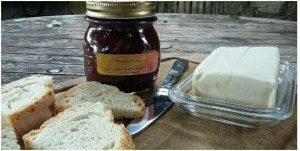 Slow food: farm to table cherry jam! Today we talk about our natural and slow experience. The sun finally arrived again here in Chianti, our cherry tree in the garden is plenty of colourful, juicy and delicious cherries. We’ve decided to pick them before all the birds are going to eat them all. Some months ago Alessio used a natural method to preserve the fruits from the birds. He attached some long glittering paper pieces on the branches. As you can see, we live in the countryside and we use every gift from nature. 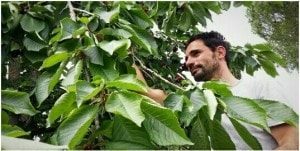 Alessio uses natural methods to cultivate and save ìour fruits and vegetables from birds and other animals. The cherry harvest was a very peaceful moment. 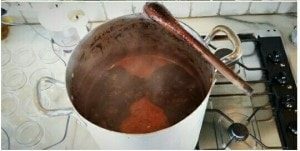 We are always busy with all our tours and we We first have to clean the cherries and take out both the pit and the leaves, afterward, we boil them in a huge pot with sugar for about one and a half hour and then…finally our “pane, burro e marmellata” is ready to be enjoyed! Who’s joining us for a late delicious breakfast? The jam is still warm!